Our children don’t need any encouragement in the area of scatalogical humor, but here we all have been anyway, laughing through the pages of Dav Pilkey’s new Dog Man. (Pilkey of Captain Underpants fame.) That is to say–this book would not be something to read to your four-year-old daughter. Unless, uh, she had two older brothers and was already unfazed by such humor. Dog Man, as Pilkey tells it, is the creation of George Beard and Harold Hutchins, two comic-writing friends whose teacher, Ms. Construde, clearly does not appreciate their “disruptive activity in my classroom.” All my kids love it, of course. Doctor: I’m sorry Greg, but your body is dying. and your head is dying too, cop. Officer: Rats! I sure hate my dying head! Nurse Lady: Hey! 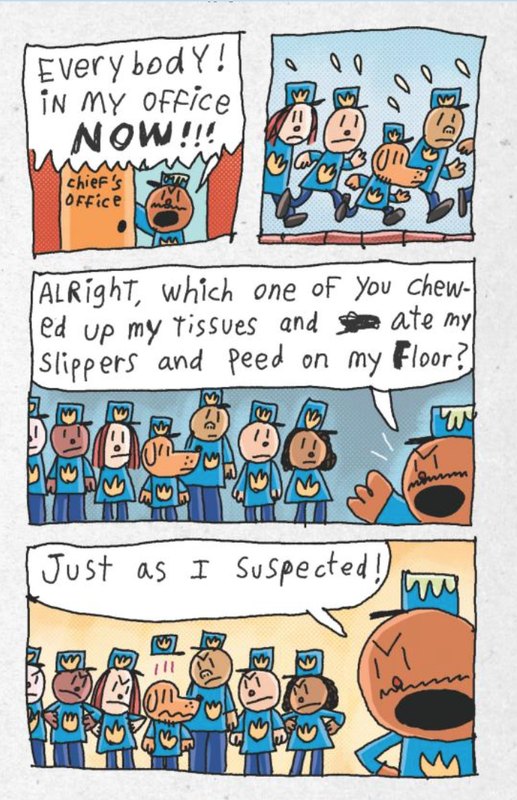 Why don’t we sew Greg’s head onto cop’s body? Doctor: Good idea, nurse lady! You’re a genius! OH look! Little baby hot dogs are starting a revolution!!!! We’re not little babies! we’re regular sized! A fun feature that comes up at several points is the “Flip-O-Rama,” where you can create a little bit of animation by quickly flipping between pages. At this moment I’m looking at the book’s warning: “Remember—Flip it, Don’t Rip it!!!!! !”, which happens to be right next to a newly made rip in our edition. Oh, well. The section in the back of the book with “How 2 Draw” different characters is icing on the cake. If you’re trying to avoid scatological humor, don’t get this book. If you’ve maybe slacked a little with your standards for your kids in that regard, they’ll probably love Dog Man. You can find the book at Scholastic’s page here. It’s also available at Amazon here. 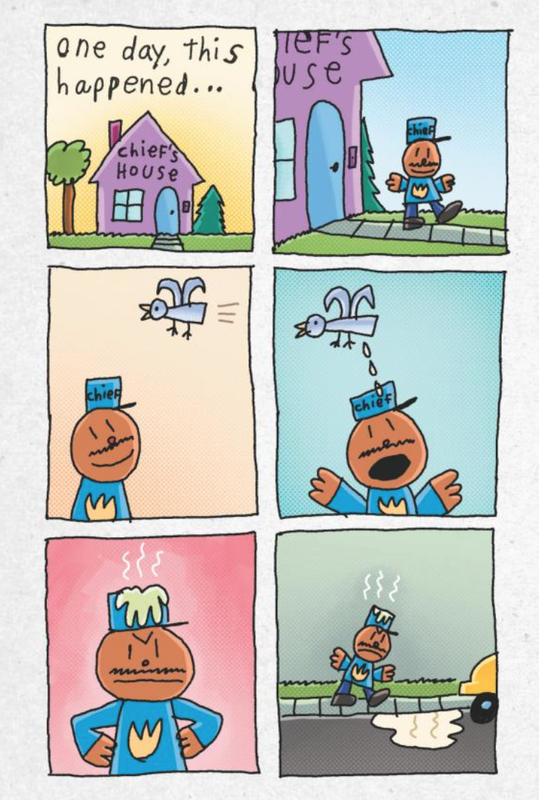 Dav Pilkey’s got his own site, too. Thanks to Scholastic for the review copy, given with no expectation as to the content of the review.